“Brighton……..Brighton, way’nuff please” the megaphone crackled. “Brighton Coxie, I’d like to speak to you.” I really didn’t know what he wanted, but I knew enough to know that if a USRowing referee wants to talk to you after a race it isn’t without cause. “Let it run” I mumbled, still scratching my head about why the referee’s launch was trundling our way. We had just won a 1,500 meter duel by about 300 meters. Granted we shut-it-down after the start but we kept it above a 28. Was that unsportsmanlike? After all it was only a heat, the white flag had been raised, and my whole boat was doubling up that weekend into two fours, too. To understand the impact of what had just occurred, you have to know two things. First, the regatta was on the Erie Canal, which is barely wide enough to host a duel race, and narrow enough you can talk to people on the other side without yelling. My family–and the family of every rower competing that day–was standing on the shore and heard every word the referee had said to me. Second, the referee was a priest. I had just been publicly scolded by a pious man. No one was on my side. As coxswains, the words we choose define us. Words are our arsenal when racing side-by-side against a rival. They’re our tools when coxing long, steady state rows. Swear words are as useful as almost any other words a coxswain can say, and, if used properly, can be very effective. 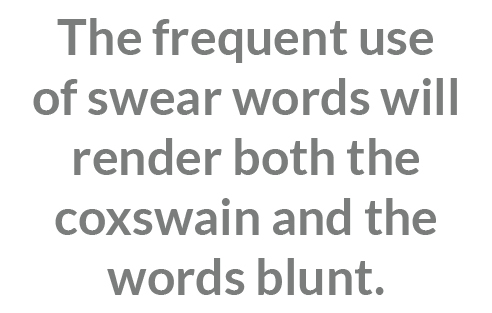 But, the frequent use of swear words will render both the coxswain and the words blunt. Imagine rowers are nerves and your words are the electrical impulses that flow through them. Regular use of high voltage words (or phrases) will make them ineffective and dull the nerves. You wouldn’t scream “ON THIS ONE” or “NOWWW” in low intensity practice would you? Of course not. The role of a coxswain–at the most basic level–is to lead the crew. Remember the first day you coxed? You learned Port, Starboard, way’nuff and then you were sent out in charge of eight or four of your friends. Somewhere in there, probably in the first week, someone told you about “Taking a 10.” Maybe you had an older coxswain to talk to, maybe you did some Googling, but I’m guessing a few weeks later your stroke was telling you to “take 10s” for all sorts of things and that was the origin of your coxing voice. It’s important to recognize that talking and leading are not the same thing. A coxswain’s words are the oil for a smooth row but can very easily become a roadblock that holds a crew back. It would be reasonable to think that a coxswain who is screaming at his crew and throwing out swear words appears to be motivational and doing more for their crew than a coxswain whining in the stern “Come on guys…..” and counting off every stroke, but you would be wrong. Those two coxswains are holding their respective crews back with their unending flow of meaningless words bouncing off the rower’s brains. Words on their own are inert. The power of words–including vulgar ones–comes from your restraint. Silence or beats of rest are the difference between music and a car horn, and restraint is the difference between an effective coxswain and a useless word salad. Being able to take a beat and giving your calls a bit of space exponentially increases their effectiveness. Giving words meaning and value is the difference between a good coxswain and a great coxswain. To be able to do it when the heat is on and you’re down a seat, is the difference between a great coxswain and an elite coxswain. If you ask my 2005 IRA crew what the difference was between the silver and our bronze they will tell you it was not the .35 we lost by but my unclear sprint, and they would be right. I’ve heard the tape; that one’s on me. The difference between impactful or valuable calls and a word salad roadblock is a little silence, and a lot of thinking. Next time you’re in the seat having a slow technical row, or a long, steady state practice make a conscious effort to think about what you are going to say, and what words you are going to use. Take time and think: What is the best way to say this? How clear can I make it, and how will this call impact the rowers? Make that leap to being a great coxswain, and when you do, it’s best to keep the curse words in your pocket. Those will get you DQ’d. This article is dedicated to the memory of Fr. Mike Siconolfi, S.J.